FRAMED PRINT. 22x18 inch (56x46cm) Framed Print with Black Satin with Off-White Digital Mat. Artwork depicting BLUNT/CAPRICORN/PL 47. The constellation of Capricorn, this version has the head, shoulders and fore- legs of a goat and the hind body and tail of a fish. Professionally made to order in the USA. Artwork Description... 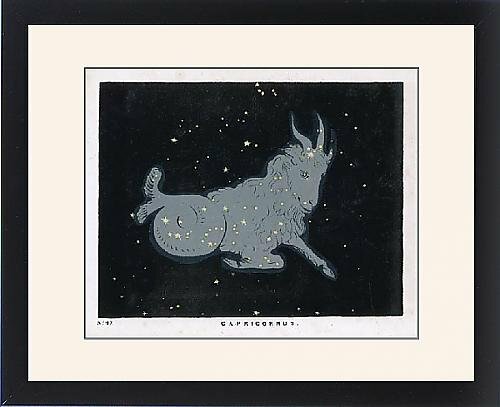 The constellation of Capricorn, this version has the head, shoulders and fore- legs of a goat and the hind body and tail of a fish.